New Director Missy Paschke-Wood adjusts to life in Lafayette while leading the day-to-day operations of Acadiana’s premier tourism event. It’s 8:51 a.m. on Pick Up Day, and though visitors aren’t supposed to stop in for another nine minutes, a new but soon-to-be familiar face is already poking his head inside the office door, the one occupied appropriately enough by the lady with a hefty surplus of pick-me-up. “Hello!” says an enthusiastic Missy Paschke-Wood, the new executive director of Festival International, greeting the first Amis du Festival (a donor group) with vigor not often found after 12 cups of coffee, let alone before one. She hands the man, a former president of Festival International, a T-shirt as a thank-you for his financial support, small talks for a bit, then directs him to a tray of doughnuts. Before, donation gifts were simply mailed, but Paschke-Wood wanted to add the face-to-face personal touch, a slight but important change in procedure. So is this pretty much what it’s going to be like every day from now until April 23? “From what I understand, yes,” she says with a laugh. 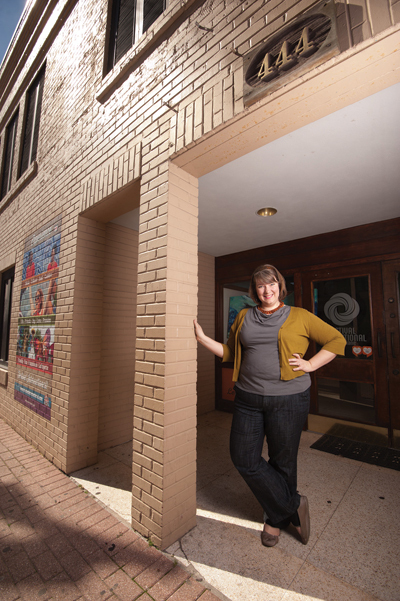 Hired on Oct. 21, 2013, to replace longtime director Dana Baker, Paschke-Wood’s abbreviated run-up in overseeing her first festival has been a whirlwind of meetings and greetings all while finding her footing in this new job, new home and new life, really. Well-versed in nonprofit management from her time spent with the Humane Society and a large professional theater company in Arizona, Paschke-Wood’s fingerprints probably won’t be noticeable this year as she leans heavily on her experienced staff – particularly Diane Harris and Lisa Stafford – to ensure this massive event that attracts close to half-a-million people to downtown Lafayette runs smoothly. Considering she’s in charge of arguably the premier tourism weekend in all of Acadiana, it’s somewhat incredible to think that this time a year ago Paschke-Wood wasn’t even living here. Last summer, her husband, Jeremiah, applied for jobs across the country, hoping to land a university gig to suit his recently completed master’s degree in Library Sciences. UL responded, flying Jeremiah in for its open assistant professor position at Dupre Library. Within minutes of posting their intentions to move to Lafayette on social media, Paschke-Wood’s inbox was flooded – places to live, places to see and especially places to eat. Some of her more ambitious friends took it a step further, not only spouting off restaurant recommendations but also their favorite items on those particular menus. The hospitality amplified once Missy and Jeremiah arrived. In fact, it was one of Jeremiah’s co-workers who clipped out a newspaper blurb about the executive director vacancy at Festival International. Considering Paschke-Wood’s professional background, the co-worker figured it’d be a natural fit. While settling into her new position, familiarizing herself with the staff and volunteers, Paschke-Wood also found it imperative to try and understand the essence of Festival International. After watching clips of performances from years past, Paschke-Wood decided to organize a quasi-Field Trip and spent a November day walking the entire downtown imprint of Festival International. When she starts up her office computer each morning, Paschke-Wood is greeted by a ticking countdown clock smack-dab in the upper right corner of the Festival’s homepage – a digital reminder that spurs more excitement than anxiety. Though there’s much to do, Paschke-Wood’s trust in her support staff tempers any new-kid jitters that might arise in these final weeks and days. In fact, Paschke-Wood intends to spend a portion of her first Festival just like the 400,000 friends surrounding her – as a spectator bobbing her head along to the music of the world.